Johnny Sexton scored 11 points as Ireland eventually found their 2018 form with a demolition of a wretched France in Dublin. Coming off the back of three unconvincing performances, the champions were required to produce the goods for boss Joe Schmidt, in his last competitive home Six Nations game, ahead of a possible title decider against Wales next weekend. And that they did. Leading 19-0 at the break through tries from Rory Best, Sexton and Jack Conan, they put the game to bed when Keith Earls crossed in the 56th minute. 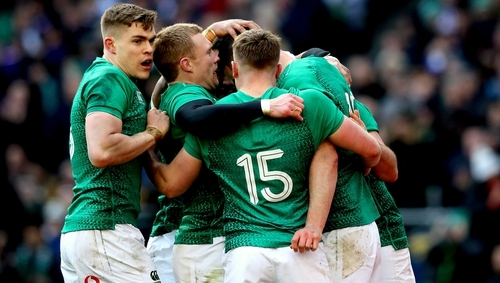 The visitors had come off the back of a handsome win over Scotland but never got into the game, which was played out amid snow, rain and sunshine at the Aviva Stadium. Ireland must beat Grand Slam chasers Wales on Saturday and hope that Scotland can produce an upset in Twickenham against England later that day in order to retain their crown. Of more importance, given the expectations surrounding the team in World Cup year, was that an erstwhile stuttering Ireland found that elusive cohesion. Bolstered by the return of James Ryan, named man of the match, CJ Stander and Garry Ringrose, they found their flow, just in time. Ireland made little of the late withdrawal of full-back Rob Kearney (calf) with replacement Jordan Larmour's kick setting up field position from which they got their first score in the third minute. France had been warned for a side entry and when Iain Henderson claimed the subsequent lineout, Best, who confirmed he will retire after the World Cup, pushed over for the try, which Sexton converted from the sideline. That served somewhat to quieten the visiting fans, who were noticeably louder than the home supporters in the opening minutes. After getting the benefit of a TMO decision to rule out a French touchdown, Cian Healy was denied when the officials spotted a knock-on on the line down the other end. Ireland were completely dominant in the opening quarter, bossing 74% of possession and 89% of the territory. Their general play was much improved from anything seen to date in the championship but a couple of knock-ons, a loose interpretation of the offside rule by the officials, and desperate France defence kept them scoreless until the half-hour mark, by which stage the injured Josh van der Flier had been replaced by Jack Conan. The hosts were playing a penalty advantage for yet another offside and Sexton ran in after looping with Garry Ringrose for his tenth international try. The returning centre, who missed the Scotland and Italy wins, almost had one of his own seconds later but lost the ball forward on the slide over the line after collecting Sexton's up-and-under brilliantly. But Ireland's dominance soon paid off and Conan finished off a move after Henderson had ripped possession from Demba Bamba. The visitors, whose selection was unchanged for the first time in 76 games, offered nothing of note in the opening half. Which France would turn up? None of them. France made more of a fight of it at the start of the second half but never looked like breaking a defensive line where Ryan and Stander stood out, making 13 and 15 tackles respectively. And Stander was central to Ireland's bonus-point try in the 56th minute, finding Earls with a delicate inside pass that gifted the Munster wing a run-in for try number 29 in the green, Sexton slotting the extras before being replaced by Jack Carty, with the more assured Conor Murray also called ashore for John Cooney. With the game over as a contest Schmidt decided that his half-backs should not be risked ahead of next Saturday's Slam-buster in Wales. Jacques Brunel's side gave their boisterous fans something to shout about with late tries from Yoann Huget and Camille Chat, but Ireland's thoughts had turned to the Principality at that stage. Ireland: Jordan Larmour, Keith Earls, Garry Ringrose, Bundee Aki, Jacob Stockdale, Johnny Sexton, Conor Murray; Cian Healy, Rory Best (capt), Tadhg Furlong, James Ryan, Iain Henderson, Peter O’Mahony, Josh van der Flier, CJ Stander. Replacements: Niall Scannell, David Kilcoyne, John Ryan, Ultan Dillane, Jack Conan, John Cooney, Jack Carty, Andrew Conway. France: Thomas Ramos, Damian Penaud, Mathieu Bastareaud, Gael Fickou, Yoann Huget, Romain Ntamack, Antoine Dupont; Jefferson Poirot, Guilhem Guirado (capt), Demba Bamba, Felix Lambey, Sebastien Vahaamahina, Wenceslas Lauret, Arthur Iturria, Louis Picamoles.